Planning a trip to the magical isle this Winter? 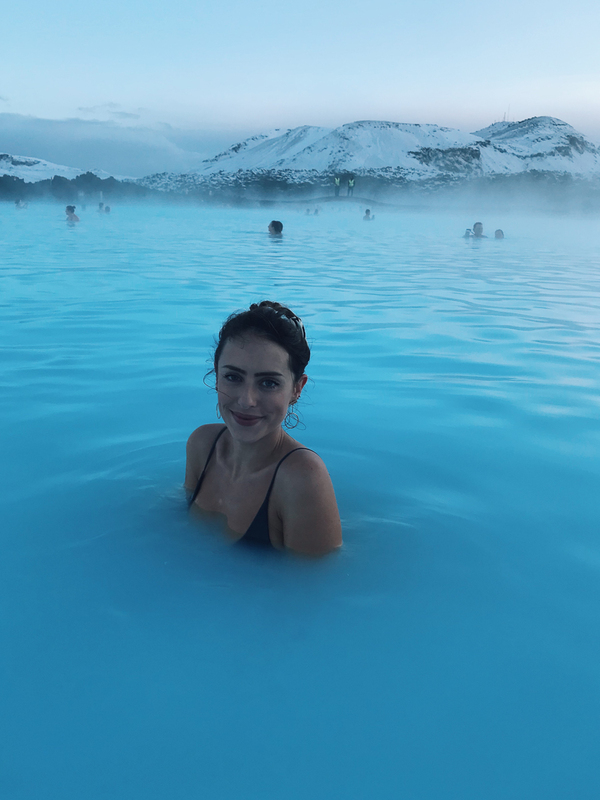 Here’s my top 10 things to do on your first trip to Iceland. The unique and beautiful country of Iceland has been at the top of my travel wish-list for years, the love affair started with the wonder of the Northern Lights, followed swiftly by an adoration of the blue lagoon and completely solidified by glimpse of the stunning scenery. So when I was invited on a content creation trip to Iceland I was so excited to hear that I would finally be able to see all of the fascinating and beautiful landscapes I had been admiring pictures of for the past few years. Asides from shooting with the rand I was left to my own devices when it came to planning an itinerary and the whole experience of booking our 72 hours in the country was quite a challenge! One I’m glad I took the time to do however! 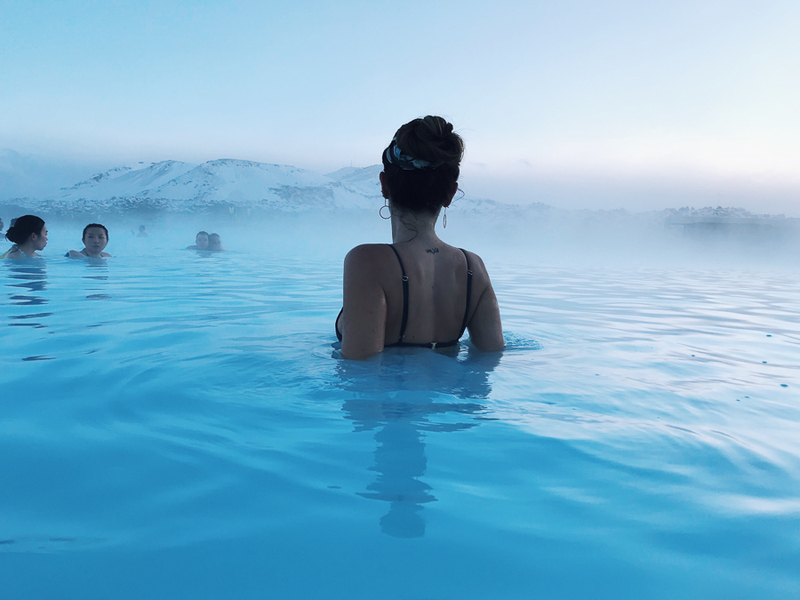 Having just returned from the ‘out of this world’ destination, I wanted to take the stress out of planning for you guys and compile a list of must-see’s and must-do’s for any of you who may be headed to Iceland in Winter. For me, a visit to this man-made geothermal pool is an absolute must when visiting Iceland. Spend a few hours bathing in the heated bliss and take full advantage of the free face masks on offer for a unique and unforgettable spa treatment. The magic of the lagoon is one that can only be truly appreciated during a visit and for a true wow factor head there for sunrise or sunset. For a true adventure hire a car and explore the lands at your own pace. 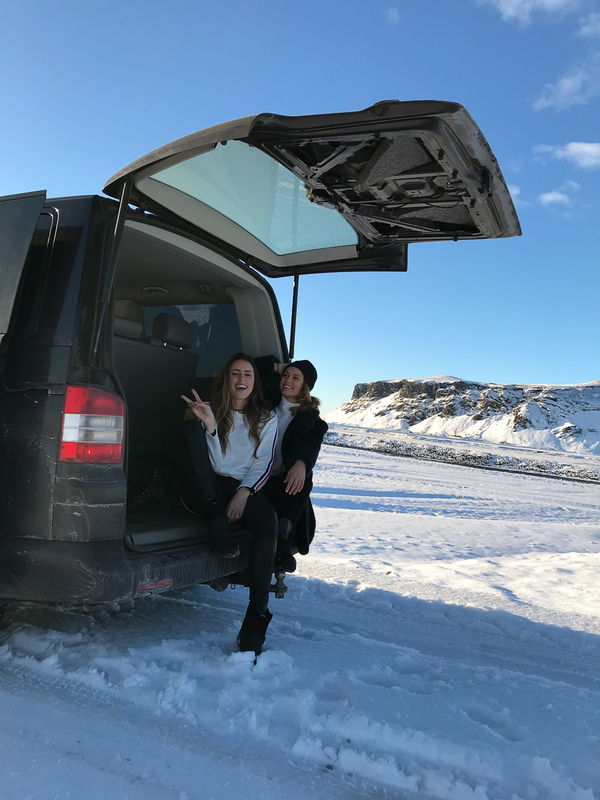 Whilst it’s illegal to stop on the side of the road in Iceland there are numerous landscape attractions that are only available to those who are not on pre-fixed group tour. 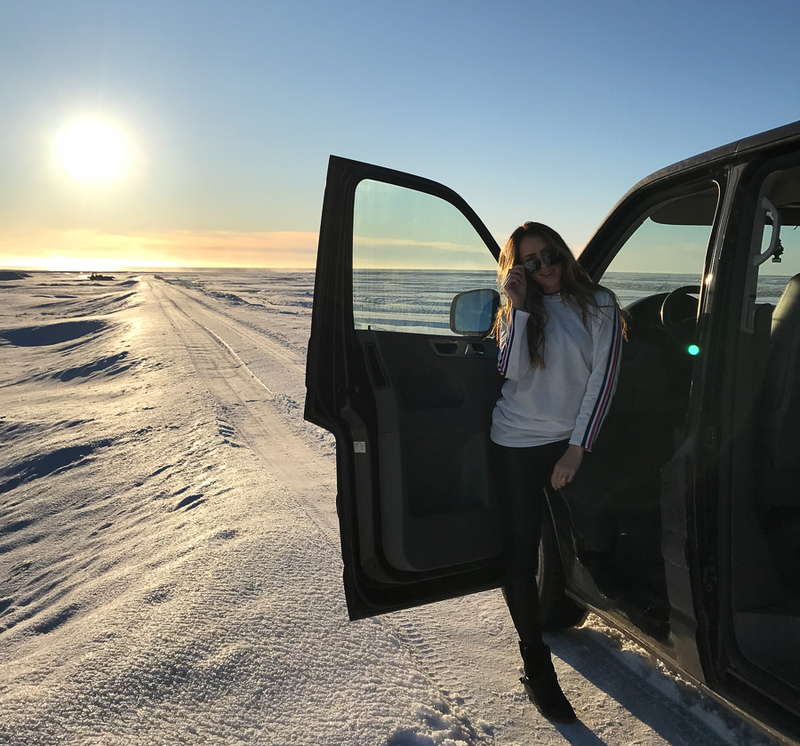 The roads are tricky to drive on during winter so in our case, we hired a private driver (with vehicle) with the company Travice Tours for safety reasons and also to have the freedom of warming up and taking in all of the amazing scenery en route! C&C Top Tip – We booked the South Shore Tour with Travice and added on a few extra stops at our discretion, I highly recommend this company! Make sure you stock up at a supermarket at the beginning of your trips, there will be long periods of time between restaurants on the road and most of them are very expensive so it’s best to snack up for the journey! My personal favourite experience was seeing wild seals swim in the stunning Jokulsarlon Glacier lagoon. The lagoon itself is breathtakingly beautiful with crystal clear, bright blue water and magnificently glistening icebergs. You can gaze in awe at the landscape but the additional excitement of seeing wild animals really ‘seals’ the deal. C&C Tip: After getting a glimpse of the natural wonder make sure you walk up and over the hill to lower grounds where the majority of the playful seals hang out. You can walk really close to the ice (but absolutely NOT on it!) and have the most amazing interaction with them. With such unique landscape after spending just a few hours in Iceland you are struck by the diverse scenery and it seems every corner you turn the view and experience is completely different . Diamond beach, however, is the most unique and interesting landscape of them all in my opinion. 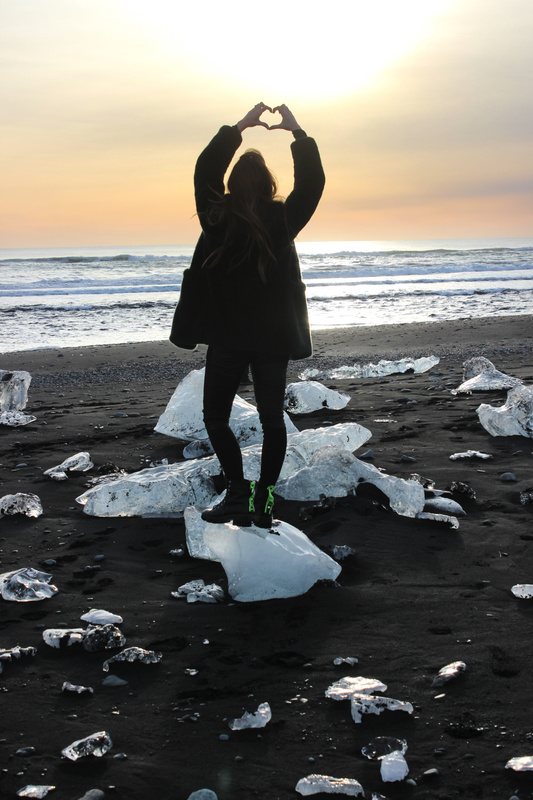 A black sandy beach with tiny crystal clear icebergs scattered along the shore’s edge. One of the most amazing experiences during winter in Iceland is witnessing the constant pink hues in the sky, with such short days there’s little time between sunrise and sunset. Black beach itself is definitely worth the visit for the spectacle of a huge dark sandy beach and to view the crashing waves that reach the shore, just make sure you DO NOT go close to the water. Iceland is home to some rather magnificent waterfalls which can be enjoyed in both winter and summer. During winter the cascading water is mesmerising against a backdrop of white snow and it’s such a rare experience to be able to see such a sight! We visited Skogafoss and Seljalandsfoss, both of which are not to be missed if you are passing by. C&C Top Tip – Make sure you wrap up warm and wear a waterproof coat, the wind is strong in winter on mist days so the water from the falls finds it’s way rather easily to you! Another adventurous and unique experience is hiking on a natural glacier. You can walk most of the glacier in usual snow-worthy shoes but when it gets to the actual ice caves you will need special ice pick shoes. There’s a number of experienced companies offering tours and guided walks within the ice caves and in the glacier but it is always weather dependant for safety reasons. C&C Top TiP – Make sure you have a ‘Plan B’ for this excursion as it’s very often cancelled due to weather. Remember that volcano that erupted in 2011 and stopped us all in our tracks? A huge ash cloud rose above Iceland as a result of the eruption and grounded through flights around the world for two weeks. The remarkable story of one family and farm that lived through the chaos can be watched in a dedicated museum at the bottom of the glacier where the farm still stands. You can also book a helicopter tour to the top for a real wow factor Icelandic experience! Something that Iceland is arguably famous for is the beautiful display of colour that dances across the sky during winter. One of the best places to see them in actually close to the airport in a place called keflavik. The Northern Lights Inn is a great option for residence during your stay as the lights can be seen from the hotel. If they appear after midnight the hotel staff will call you in your room to let you know and you can watch them from the warmth indoors rather than freezing in below minus degrees outside. C&C Tip: The hotel is a fantastic choice of stay with comfortable and large rooms, a sizeable modern spa, high class restaurant and warm communal areas. They even offer guests waffles with fresh cream and jam in the afternoon! Finally an exciting excursion to do whilst in winter is whale watching, which again, Iceland is rather famous for. Year round sightings of whales and dolphins have kept tourists flocking back to the island month after month. With just three days in the country this was one tour we didn’t get to do but as you know, wild marine life encounters mean everything to me so I had to mention this excursion especially. Read more about the experience on one of my personal favourite travel blogs HandLuggageOnly here. One of my all time favourite countries. I want to go back and see more of it!